The learning curve for beekeeping is steep. How do you make sure your bees are healthy and happy--and that they don’t sting you? 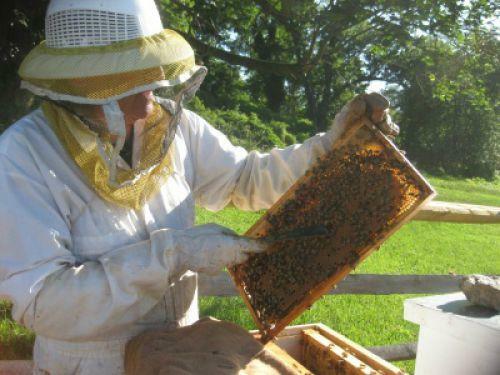 Devra Kitterman, pollinator program coordinator for the Maryland Agricultural Resource Council, tells us about their beginning beekeeper course--and her work as a swarm catcher. And managing director Wes Jamison tells us what else you can do on the 150-acre farm park --from hiking and sunflower picking to learning how to back up a horse trailer. Ilex Opaca (American Holly): evergreen, critical forage for pollinators, also food and cover for birds. The best dwarf form is Ilex Opaca ‘Maryland Spreader’ that grows in an undulating horizontal form. Most hollies are excellent. This year marks the 200th anniversary of the birth of abolitionist Frederick Douglass. Until he escaped Maryland--and slavery--at age 20, where did he live? Who did he rub shoulders with? Where did he work? Johns Hopkins Bloomberg Distinguished professor Lawrence Jackson and his students have created an interactive map of the time Douglass spent in Maryland. Jackson tells why exploring the physical environment helps us better understand Douglass’s growth as a black leader, starting as a product of his community. One of the most powerful forms of healing is peer support -- receiving advice and encouragement from someone who truly understands what you’ve been through because they’ve been through it, too. Our guests today live by that philosophy. The League of Extraordinary Gentlemen Society, or LEGS, says it provides "resources and emotional peer support for gentlemen who are diversely abled." LEGS co-founder Calvin Mitchell explains the distinction. We also hear from members Bong Delrosario and Derrick Waters. That was a Stoop Story from Melani Douglass, great, great grandaughter of Frederick Douglass and founder of the nomadic Family Arts Museum. She told of a holiday party that turned ugly ... and setting the record straight with a racist guest. Particularly meaningful as we commemorate the 200th anniversary of Douglass’ birth this month. You can hear her story and many others at stoopstorytelling.com--as well as the Stoop podcast.